Solitude Mountain Resort is a relatively small family-friendly ski resort in Big Cottonwood Canyon, about 30 miles southeast of Salt Lake City, Utah. Solitude is adjacent to Brighton Ski Resort, and the two resorts offer a common pass, called "Solbright Pass," which allows patrons to access both resorts. Solitude opened in 1957. As a family-friendly resort, Solitude offers the highest ration of beginning and intermediate runs (70%) of any ski resort in Utah. In addition, the Solitude SnowSports Academy offers beginning ski and snowboard lessons for children. Solitude also offers discounted prices when patrons purchase lift tickets and lodging accommodations together. The resort doesn't cater exclusively to families with children, though; adult patrons may relax at the Thirsty Squirrel or the Library Bar, which serve beer, cocktails, and hot dishes. Solitude offers about eight dining options altogether, ranging from pizza to fine, upscale cuisine. Other amenities at Solitude include luxurious lodging accommodations, rental and repair shops, and the Nordic Center, a cross-country skiing course known as "Solitude's best kept secret." At a base elevation of 7,988 feet, Solitude receives an average annual snowfall of 500 inches. The resort features eight chairlifts and 64 runs spread across 1,200 acres of skiable area. 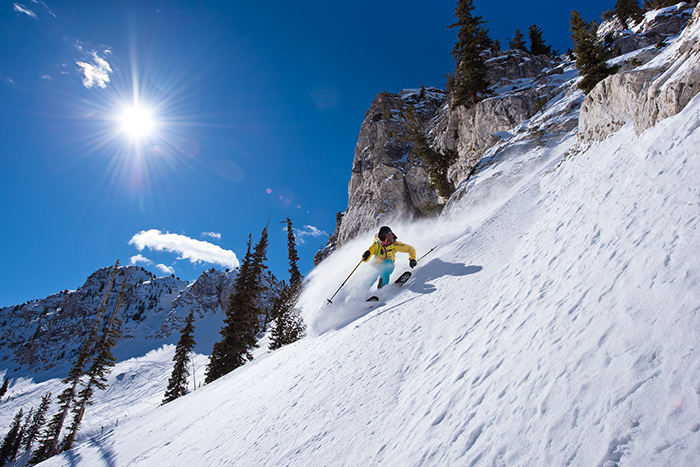 One of the most famous features of Solitude is Honeycomb Canyon, which offers the resort's best bowl skiing.